Today we take for granted that we can preserve our memories with a series of colorful photographs, but how long have people been able to do that? A History of Photography Timeline gives us a clear picture of how recent this technology really is. Black and white photography was the primary method of recording events even as late as the early 1940’s. Today one method of emphasizing color in photography is to focus on one unusually colorful object in the midst of a sepia or a black and white background. 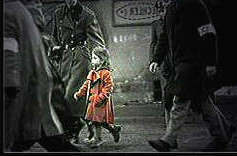 In the movie, Schindler’s List, a three and one-half hour black and white movie, the little girl in the red coat really existed: her name was Genia, and she was the last of a column of evacuees who witnessed the cold-blooded execution of a family found hiding in the ghetto. The scene and the color contrast is riveting. Imagine we lived in a world that’s all of a sudden devoid of color, but where you’re given the option to have just one object keep its original hue. Which object (and which color) would that be? The first thing that came to my mind was of the little girl in the red coat–a symbol of suffering and agony in a nation of oppressed people. Would I, could I save the child? What about other children today who suffer abuse like little lambs being led to slaughter? The term LOCAL COLOR is not directly associated with the foregoing ideas, so how is it generally used? In literature, drama or poetry, local color is a name given to distinctive, sometimes picturesque, characteristics or peculiarities of a place or period, or as observed in reality. Local color realism or regional literature is fiction and poetry that focuses on the characters, dialect, customs–all features particular to a specific region. It is also a method of telling a story with precise details from a specific locale. Things like dialect and sense of place are captured in local color fiction. 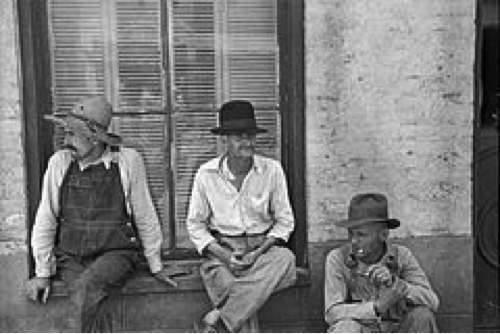 In the summer of 1936, during the Great Depression, James Agee spent eight weeks on assignment for Fortune Magazine with photographer Walker Evans, living among sharecroppers in Alabama. Fortune did not publish his article, so Agee turned the material into a book entitled, Let Us Now Praise Famous Men (1941). The two men were supposed to produce a magazine article on the conditions among sharecropper families in the American South during the “Dust Bowl”. It was during the time of U.S. President Franklin Roosevelt’s “New Deal” programs, which were designed to help the poorest elements of the American society. Agee and Evans spent eight weeks that summer researching their assignment, mainly among three white sharecropping families swallowed up in desperate poverty. Evans’ portfolio revealed stark images—of families with gaunt faces, adults and children huddled in bare shacks before dusty yards in the Depression-era. This was the deep south—and Agee’s detailed notes revealed the pitiful facts about these same people. A significant difference between the works is the use of original names in Cotton Tenants; Agee assigned fictional names to the subjects of Famous Men in order to protect their identity. The book was later to be the inspiration for Aaron Copland’s opera The Tender Land. Local color writing, art and photography are imbedded in my history–a history in black and white. Born in Lubbock, Texas, right in the middle of the Great Depression, I was part of it all. 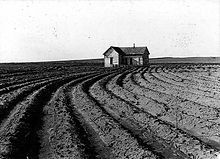 My parents knew full well the meaning of both the Great Depression and the Dust Bowl era. For them married life began July 29, 1934, and the Great Depression lasted until the mid-1940’s. In July 1939 my own life began, and even today I have personal mental images of the poverty and suffering seen in the photo archives of the Library of Congress. I was there. Power farming displaced tenants from the land in the western dry land cotton area of the Texas Panhandle. The empty farm houses stood out from the landscape like warts on a frog. Ghost towns like Goodnight, with its sod houses, cowboy bungalows and magnificent ranch houses became tourist stopovers along the highway from Dallas to Amarillo. Some who left were seeking the bright lights, but others were merely seeking to feed their families. In spite of the hard times, my father never lost his love of the soil, so he continued to farm and work in town too. 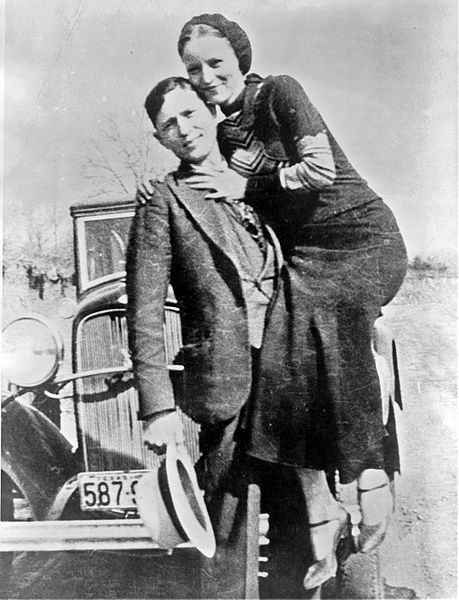 During the Great Depression, bankers became so unpopular that bank robbers, such as Bonnie and Clyde, became folk heroes. One event my parents liked to recount was their close encounter with Bonnie and Clyde and how their own car caused them to be suspects at a roadblock because it was identical to the 1932 Model A Ford the bank robbers drove. My parents were on their way from Abilene to Quail, the tiny town where my father had grown up, when they were detained for a few hours. So what object or prize would I want to remain in full Technicolor if all else were colorless? Probably no one thing more than any other. For me there are many good memories and a few nightmares–all in black and white and I prefer to keep them that way. I’ve suggested this very question, in one of my earliest posts, in talking of the sacredness of color in our world. And I was going to mention it in an upcoming post on blogging. =) There is much to say on color. But that each one has its own active (healing) property might have to do for now. Green, for instance, cleanses and renews. Green foods do that for the liver and blood. Enjoyed the writing, Beth. I would like to see more on the idea of color in our world. 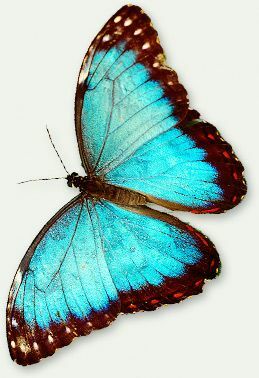 Do those who become easily depressed tend to choose a particular color? Do colors cheer or depress? When we think of people we love, what colors are associated with those loved ones? Speaking of green foods… I was reared to love greens of all kinds, but my hubby of almost 54 years says he is not a cow and refuses to eat them. My eyesight needs those particular vitamins from greens, and, since I cannot get them naturally, my doctor says there are substitutes such as I Caps with Lutein and Zeaxanthin. The more I tell the more I seem to remember that should be told. Seventy five plus years of memories is an awful lot of memories. The stories are brewing. Today I have been trying to label photographs according to the geography as well as the years. Funny you asked this question… I just took a picture of myself in a Fedora I got working security for a bar mitzpah last night. The hat is black and white plaid with Red trim.. I wish I could post it here! I’ll email it too you! But it looks best in black and white but I wish I could show the hat in its color. I’m sure there’s a website somewhere I could seek help. Nice article, thanks for sending it too me. Life is getting very busy very fast these days so I need all the help I can get. Love to you Beth. Laura, I am not sure if there is an option peculiar to certain types of blogs, but one lady sent me a photo of a book in her response to my comment on another person’s blog. Maybe it was just a copy/paste, but it came through. Try that to see if you can make it work. You know, I tried that.. but it doesn’t give me the paste option when I’m in the comment box! Oh well I’m sure you got it by email. Maybe I’ll make a post of it once I find time to color that hat.. lol. Happy Monday, (or is it Tuesday by you?). I wonder if there is an option, I never found one but maybe that’s a feature if you have your own host website. I’m still at wordpress.com maybe that person wasn’t. You and I both are still learning. We must watch and learn new “tricks of the trade” from fellow bloggers every day. Yes ma’am! If I find out anything I will let you know. This was fascinating, Beth: one of the Russian ice skaters in the Winter Olympics wore a red coat and skated to the theme from “Schindler’s List” — it was lovely. I especially enjoyed the part about your parents: interesting that professional photographers often decide not to use color today; I suppose there are many reasons for that decision. Sandi, the color focus must be intended to direct the mental focus. It works both ways, perhaps. Eyes are windows to the soul, so conversely, what photographers intend for us to “see” may be representative of a bigger picture with a deeper meaning.